In some countries, there may be only one individual who stands alone, such as GCHR’s Board member Ahmed Mansoor, now serving a 10-year sentence in the United Arab Emirates. Calling him “the last defender”, GCHR Executive Director Khalid Ibrahim noted that Mansoor was an essential source of information to human rights organisations who struggle to report on violations now that every human rights defender is exiled or imprisoned in the country. During the Platform, Special Rapporteur Voule said, “At the end of the day, what we want is for all citizens to enjoy their basic rights.” He asked, “If civil society doesn’t work together, how are you going to work against climate change, inequality, poverty,” or other issues? “It’s important that States recognised the role of civil society to improve the situation,” he added, which requires freedom of expression, assembly and association to thrive. Radhya Almutawakel, Chairperson of Mwatana Organisation for Human Rights in Yemen, and GCHR Board member, stated: “Our work has had an impact. One indicator is when activists are imprisoned.” In order to carry on their work, “human rights defenders need support. It’s not going to take 100 years. I will be hugging Samar Badawi soon,” she concluded, referring to the jailed Saudi woman human rights defender, who is among at least 17 known women’s rights defenders in prison in Saudi Arabia today. 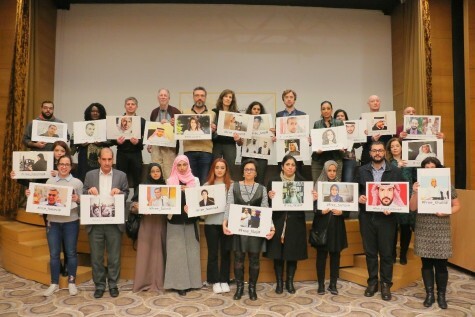 Those in attendance at the event spoke emotionally of the personal connections to many of those in prison, such as GCHR’s Founding Directors Abdulhadi Al-Khawaja and Nabeel Rajab in Bahrain. “We will never stop working until they are free. Many of them have kids who need them, and we love them,” said Khalid Ibrahim.